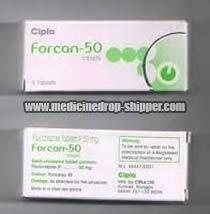 We are highly engrossed in supplying and exporting Forcan Tablets in Maharashtra, India. In a bulk powder form, it appears as a white crystalline powder, and it is very slightly soluble in water and soluble in alcohol. We procure them from the renowned vendors in the industry, who use the premium grade chemical compounds and advanced techniques for manufacturing them. Our offered Forcan Tablets are known for their accurate composition, reliability, safe consumption, and high effectiveness.